Su Bristow’s Sealskin is a book I found completely enchanting. Although I’d had a copy for a while and was desperate to read it, especially as all the wonderful reviews started appearing, I wanted to save it to read when I was on holiday. The reason for this is that I was holidaying on the Isle of Lewis, a place where I could easily imagine Sealskin could be set. While on a walk which went passed Stornoway harbour, I was delighted to see some seals swimming leisurely by a fishing boat which was being unloaded. It made me think that this was the kind of sight seen daily by Donald and the other fisherman in the village. The book starts with Donald watching seals or rather selkies transforming into beautiful women. The selkie myth is strong in Scottish (and other) folklore. The story goes that selkies can shed their seal pelts and change into human forms who are very attractive to real humans. If the human steals their skin, the selkie must stay in human form but if they find their skin, they will almost always choose to return to the sea. Donald is captivated by the transformed selkies and hides one of the sealskins. He commits a terrible act and spends the rest of the book trying to make amends. He takes home his Selkie, who his mother names Mairhi. I must admit to being rather uncomfortable with what happened being described as a mistake. However, the legend of the selkie talks of selkies being ‘forced’ to become wives so, as this is a retelling, it has to be read in this context. This book was so beautifully written in such lyrical style. Here is just one example from near the beginning of the book: The boat was silvered all over with tiny frost-flowers sparkling in the moonlight. How evocative is that image? And this kind of beautiful poetic language appears throughout the book, creating a very mystical atmosphere. I felt that Su Bristow has captured the atmosphere of the village perfectly. It’s a place where old rivalries run deep and where people are highly superstitious and suspicious of things they don’t understand and people who don’t fit in. As Donald’s mother Bridie puts it when she is talking about how people fear Mairhi “She frightens people even when she means no harm. Not the younger children. Nor the beasts. It’s only those whose heads are full of how things ought to be”. Magic woven into the fabric of this captivating book and it certainly had me under its spell. Exceptional story telling and a book I will be recommending to everyone! What happens when magic collides with reality? Donald is a young fisherman, eking out a lonely living on the west coast of Scotland. One night he witnesses something miraculous …and makes a terrible mistake. His action changes lives – not only his own, but those of his family and the entire tightly knit community in which they live. Can he ever atone for the wrong he has done, and can love grow when its foundation is violence?Based on the legend of the selkies – seals who can transform into people – Sealskin is a magical story, evoking the harsh beauty of the landscape, the resilience of its people, both human and animal, and the triumph of hope over fear and prejudice. 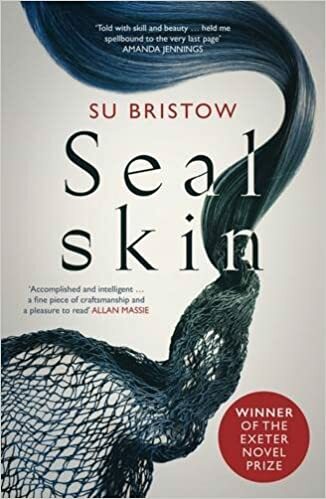 With exquisite grace, Exeter Novel Prize-winner Su Bristow transports us to a different world, subtly and beautifully exploring what it means to be an outsider, and our innate capacity for forgiveness and acceptance. Rich with myth and magic, Sealskin is, nonetheless, a very human story, as relevant to our world as to the timeless place in which it is set. And it is, quite simply, unforgettable. Su Bristow is a consultant medical herbalist by day. She’s the author of two books on herbal medicine: The Herbal Medicine Chest and The Herb Handbook; and two on relationship skills: The Courage to Love and Falling in Love, Staying in Love, co-written withpsychotherapist, Malcolm Stern. Her published fiction includes ‘Troll Steps’ (in the anthology, Barcelona to Bihar), and ‘Changes’ which came second in the 2010 CreativeWritingMatters flash fiction competition. Sealskin is set in the Hebrides, and it’s a reworking of the Scottish and Nordic legend of the selkies, or seals who can turn into people. It won the Exeter Novel Prize 2013. Her writing has been described as ‘magical realism; Angela Carter meets Eowyn Ivey’. What a lovely review, Joanne. And to read the book whilst holidaying in the kind of place where it could be set – perfect. I’m a bit entranced by Scottish islands myself. It was just the perfect place to read such a wonderful book.